I grew up in Etobicoke. Nearby by my home was this family run fish and chip restaurant. We used to go all the time. I used to love watching him, John, drop the batter coated pieces of fish into the oil and wonder at how the batter would magically puff up like a cripy pillow. I loved their fresh french fries which were cooked in the 'over dark' way that I find fries are done here in Toronto. They're very much unlike the bright-golden fries in the fish joints in Vancouver. I wrote earlier I assumed that that was attributed to local tastes or older oil. I think it might be a combination of both. 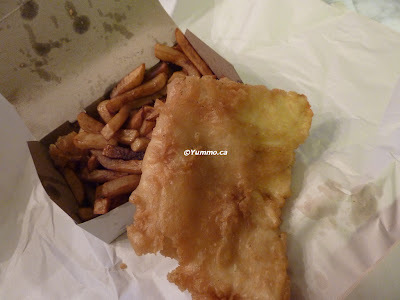 Well, I recently moved back to Toronto and was hanging out with a cousin who, having moved back from Manhattan, will drive all the way to Scarborough from downtown for his fish and chips. He grew up there and still hankers for the nostalgic tastes of childhood. Having heard from my other cousin that he'd dragged there that the fish was ...'just eh'. I threw down the gauntlet of a 'childhood fish and chip off'. His Scarberia greasy spoon against John's. Well, I thought if I'm going to put my name on the line here, I should at least revisit. I hadn't been back since, well, over a decade. I mean there used to be a high school where about 4 condo towers and a hundred townhouses stand today. So last week afterwork, I dragged D and my dad (as if dad needed dragging to fried food) to a bit of boxed nostalgia. The three of us ordered Halibut and Chips with Coleslaw for takeout. We rushed home as fast as we could. My folks only live 10 minutes away. Even so, Fish and Chips are very unforgiving about being toted about. But we all made allowance for the slight wilting due to steam as you do. That said, it was still a bit of a ... like finding Santa's wrapping paper in your parent's closet. Yeah. The Fish was a nice big portion as I recalled. My favourite place in Vancouver, Go Fish! have been culling back on their portions to a point that I fear when I go back someday with lil T, I'll receive a fish stick in my basket. Anyhoo, the batter was crispy as I remembered but very very very oily and I realised alot of the 'wilting' was not steam from the carry out but from the oil. As well, the batter itself was a bit bland and flavourless. In the days of my youth, they may have relied on the fat frying flavour and now having retained the recipe but changed for healthier frying fare like canola and the like, have not added anything to the batter like beer or seasoning. This meant that I was going to shamelessly abuse the amount of Tartar sauce. I was quite palpably embarassed that they used prepackaged squeeze packs rather than homemade. I think any self respecting fish restaurant should make their own Tartar sauce. I've had brilliant Fish and Chips with homemade Tartar sauce out of a truck, Frying Scotsman, in Portland. Sigh. At least they also threw in some prepackaged squeeze packs of Malt Vinegar. Mmmmmm. Fries need vinegar! The Fries were okay. They were that typical dark fry that I mentioned and a bit soggy from the trip home but still crispy. That said, I watched the cook in the back dump the fries in the oil from a bag. Sigh. They do not cut their own fries from Potatoes. How hard is that. Get a press attached to your wall and cut your fries as you go. The other two places I mentioned, one out of a truck and the other out of a used railcar, both do. Then there was the slaw. D's words were 'bucket slaw'. John correct me if I'm wrong but the slaw did indeed appear to be pre-made slaw. The well soaked, machine cut, vinegary Cabbage and Carrot Coleslaw. It was okay but again, as it wasn't a fast food joint and specialising if Fish, I expect fresh cut fries, homemade Tartar sauce and in house Slaw. Sigh. I fear that unless my cousin was grossly exaggerating about his Scarborough fish, I may lose this challenge. I'll have to give it one more go before I totally walk away and eat in next time. But today, I found Santa's Christmas wrapping behind dad's box of old shoes. Family friendly: did not check the bathroom for change table but a few kids were colouring in the dining room.